1The names in this story have been changed. Carolina, who is thirty years old and single, lives with her daughter in a three-room apartment in what’s considered a middle-class barrio. Natalia rides a bus an hour and a half each way to attend a bilingual preschool farther north. Most of her classmates reside there, an area where luxury high-rises dominate the landscape. Housing in Bogotá, as in all Colombian cities, is governed by a unique stratification system that designates buildings and their inhabitants with a number from 1 to 6, called an estrato. Those who belong to the lowest estratos, 1 and 2, reside in the city’s most derelict neighborhoods, with 5 and 6 labeling homes in the wealthiest urban districts. The number designation determines a household’s tax and public utilities rates, including gas, electricity, and water. Cities began implementing the wealth redistribution mechanism in the 1980s, and the federal government codified it in 1994. The idea is benevolent at heart: Charge the rich more for services to subsidize the poor. And the cross-class subsidy does serve that aim, but it simultaneously reinforces Colombia’s strict social hierarchy. Poorer people are branded with a lower-class designation that restricts upward mobility, all but ensuring they stay poor. I first met Carolina outside Colegio Nueva Granada, a private bilingual K–12 school that teaches an American college preparatory curriculum. Perched on the side of a hill at the foot of the Andes Mountains, the school is among Bogotá’s richest. Carolina teaches Spanish to its international faculty. We headed down the hill together, leaving the campus. Within five minutes of walking we were in the Bosque Calderón Tejada neighborhood, a small barrio she says is classified as estrato 1. A child was playing in the dirt with sticks, and several stray dogs wandered past. Across the street an old woman was clipping laundry to a line strung between a brick building and a lamppost. Outside a tiny store proffering sweet rolls, empanadas, and glass bottles of Coca-Cola, Carolina said she loves the lower estratos for their tiendas and street food, especially tamales. In upper-class neighborhoods, she said, everyone shops at supermarkets, and “the concept of tamales is like a very disgusting food, because you can buy tamales in the streets, so it’s not very clean.” But for Carolina, the traditional dish tastes like childhood. She pointed to the buildings, amalgams of brick, cinder blocks, and solid concrete. Most of them were two or three stories and lidded with sheets of corrugated steel anchored by rocks. “Every part of the house is a different construction, because it takes years” to build them, she said. Most people can’t afford to finish an entire house in one go, so they make additions to their informal shacks as finances permit. What the unfinished homes lacked in structure, though, they countered with vibrancy, with some exterior walls painted bright goldenrod, turquoise, and mauve. In estrato 1, Carolina explained, every house belongs to a landlord who rents each room to a different family. She pointed to one orange brick building with a yellow façade and green-trimmed windows. “In this house there are maybe several families, every one living in a different room. And they share the kitchen and the bathroom,” she said. A modular skyscraper towered in the distance, a recent construction that houses diplomats, business people, and other members of Colombia’s elite. When Carolina was young, her family couldn’t afford to pay rent in their area zoned as estrato 1, so they moved monthly from single room to single room to evade landlords in one of Bogotá’s most heavily armed and drug-ridden neighborhoods, Caracolí. “Every day when I was a child, a dead person in the street,” she said. The slum remains one of Bogotá’s most dangerous. Many of its residents are among the millions forcibly displaced by the country’s ongoing fifty-year asymmetric war between left-wing guerillas, right-wing paramilitary groups, and state military forces. The country’s largest and oldest leftist rebel group, the Revolutionary Armed Forces of Colombia—known by its Spanish acronym, FARC—has for decades justified its violence as a response to the country’s entrenched inequality. Peasant Marxist-Leninists founded the FARC with the ideological aim of defending the interests of the poor by taking up arms. But after roughly fifty years of war, both the FARC and the second largest rebel group, called the National Liberation Army, have become increasingly perceived by the public as terrorists, far from political representatives. Their members are known for killing captives, drug trafficking, and murdering civilians. As we continued our walk, the small tiendas gave way to Starbucks and upscale restaurants. Less trash littered the streets, and the purebred dogs were walking on leashes. Carolina said we had gone from estrato 1 to 5. She gazed up at one of the sleek red-brick towers, with floor-to-ceiling windows so clean they seemed invisible. “In one way, I would like to live in that place. It seems to be more clean, with a doorman, with a parking lot—wow,” Carolina said. But in another way . . .” After trailing off, she switched to her native Spanish. “It’s like, ‘I’m exclusive. I don’t want to mix with other people. I live here. You live there,” she said, pointing to the shantytown we just left. Before heading back through the security gate, Carolina finished the last of her dessert cup of yogurt, granola, and mangoes, leftovers from her cafeteria lunch. She usually eats at school, and since becoming a teacher it’s more meat and fish, less rice and pasta. But on Sundays, she told me, it’s tamales. When she unwraps a banana leaf to release the steam from a masa pie of pork, beef, and vegetables, Carolina knows she’s with family. Enjoy this Postcard? 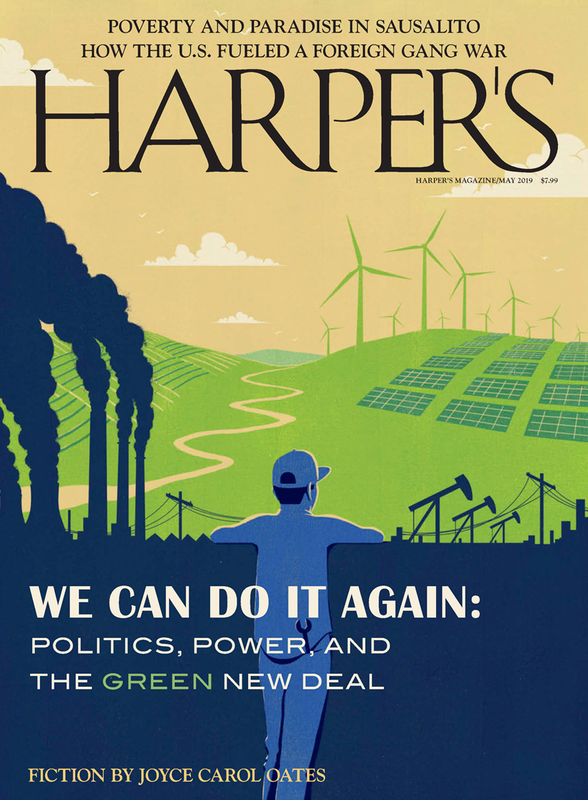 Subscribe to Harper’s Magazine and receive our print edition delivered to your door each month—plus instant digital access to our entire 166-year archive.